The first mission for DAA was flown in August 1992 and now the DAA owns two Eurocopter EC135 helicopters operating seven days a week and responding to approximately 1,400 life threatening or life changing incidents every year. In November 2016 DAA extended their service to operate until midnight, meaning they can help even more people in Devon. With one helicopter based in Exeter and one in North Devon they are able to get to most of Devon within 10 minutes and the whole of Devon within 15. This ensures patients receive treatment within the critical period immediately following acute illness or an accident and are conveyed to the specialist treatment centre most appropriate for their needs, ensuring they receive the best possible care and giving them the best chance of survival. 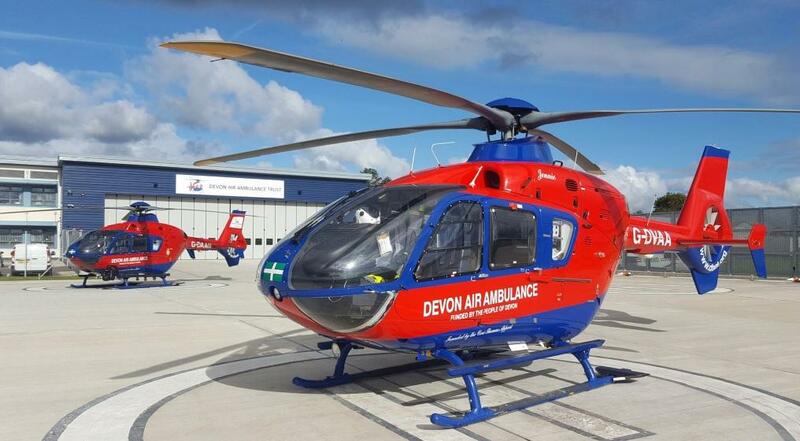 It costs £5.5million every year to keep Devon’s Air Ambulances flying and they are extremely proud to be independent of Government and National Lottery Funding; this safeguards the service for the long-term and ensures they can deliver what the people of Devon tell them they want from their Air Ambulance. DAA has also substantially improved patient care through the creation of a ground breaking Master’s Degree for air paramedics aimed at making them amongst the highest qualified in the profession. Working with Plymouth University, DAA has created a qualification which will put Devon on the map as a centre of excellence for pre-hospital critical care. Devon’s Air Ambulances are very much an essential part of the community we live in and the service would not be possible without the generous support and donations from the people, businesses and communities in and around Devon, every penny raised is making a real difference. The Westcountry Equine Fair, (Westpoint, Exeter on Saturday 2nd & Sunday 3rd December) now in its twenty first year, hosts a wide selection of educational, competitive and entertaining demonstrations in the indoor arena including: Beverley Brightman sponsored by Horsehage (dressage rider & trainer); Alexander Bragg event rider (Sunday); Grant Bazin – The horseman; Junior Show Jumping; a native breed parade and many more. There will also be the BETA sponsored Equestrian Knowledge Zone. You can ask advice from a selection of top experts including: equine vet; equine dentist; Lorinery; referral farrier; equine nutritionist, free hat and body protector checks and worming. RoboCob the mechanical horse will also be available to have-a-go to fine tune riding skills. The show is not complete without the amazing equestrian shopping village. With over 200 companies, this is a great equestrian shopping experience ‘For the horse, for the rider and for Christmas’. Don’t forget you don’t need to carry those heavy shopping bags around with the shop and drop facility in the foyer - all donations to Devon Air Ambulance.